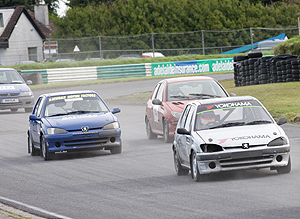 The 2013 Irish Rallycross Champion will be crowned this weekend at Mondello Park and for the first time the title will be awarded following a single event shoot out. The Irish Rallycross crown will go to the winner of the Superfinal at Sunday's season finale, and the organisers are hoping the return of the Superfinal and the awarding of the overall championship will attract a bumper entry. The Superfinal, where the fastest eight drivers across all classes combine for a single race, was omitted from the current championship, but is set to make a return for the 2014 series. The removal of this race was unpopular with competitors and its return is just one of a raft of measures being put in place for 2014 with the aim of boosting this struggling branch of car racing. A return to a calendar year format, the reintroduction of the Superfinal, the removal of the overseas round and changes to the event format have all been agreed in consultation with competitors. The championships' organising committee are confident that these changes, along with the introduction of the Honda Civic RX challenge and another, more powerful, one-make series, should see a boost in competitor numbers when the new championship commences in February. This Sunday's event will be the eight and final round of the 2012/13 series and along with the overall title, five divisional championships will be completed. The four wheel drive Supercar class will go down to the wire at the final event with Subaru Impreza driver Andrew Morris and Fiesta mounted John Kelly fighting it out for the top spot. Morris and Kelly have taken three wins each this season and are now the only two left in contention for the overall title. In the two wheel drive modified class, Ian O'Connell has been unbeatable, with his Lotus Elise taking six wins from six starts. O'Connell has the title wrapped up, but the battle for second is still alive with Pearse Browne and Willie Coyne set to fight it out. Eoin Murray is already the Stockhatch 16 Valve champ but Keith Kerrshaawe and Noel O'Brien will fight it out for the 8 Valve title. Another driver to have already secured a championship win is Sophie Byrne who has wrapped up the Junior title with four wins from the six events she has contested, but there are still the minor placings to be sorted out. The same goes for the Rallycar class where Patrick Donoghue is already the champion. Sunday's event will consist of up to four qualifying runs which will decide the gird positions for the divisional finals. The fastest eight drivers from the Supercar, Modified and Stockhatch finals will then go forward to the overall Irish Championship final which will run over six laps. Admission to Sunday's event is just €10 for adults with under sixteens admitted free of charge. For a timetable see www.mondellopark.ie.